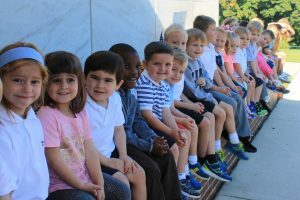 The St. Aloysius Academy Co-ed Montessori Pre-school provides a supportive and caring environment where each child can grow spiritually, academically and socially. 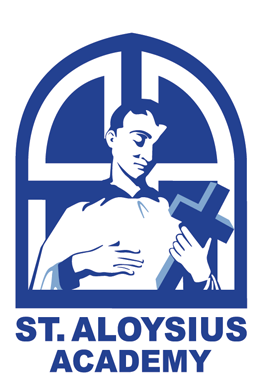 For children between the ages of 2 ½ to 5, the Pre-school is located on the St. Aloysius Academy campus in a building known as the Clockhouse. The Clockhouse offers small class sizes lead by certified Montessori teachers. The curriculum includes daily religious instruction and is sponsored and staffed by the Sisters, Servants of the Immaculate Heart of Mary. Following the educational theory of Maria Montessori, children are grouped with mixed ages so they can interact and learn from one another. Students learn language and math with attention to gross and fine motor skills taught using Montessori methods. There are many opportunities for parents to get involved, and supervised child care is offered until 6:00 p.m.
Maria Montessori maintained that a more profound impression of life is gained through movement than by simply using visual or auditory aids. Voluntary repetition of movement is of the utmost importance for mental development. Children feel a sense of calm and repose in the Montessori atmosphere because everything has its proper place. Children are free to choose and complete a task on their own. Over a three-year period, teachers guide the children in the proper use of each set of learning materials, then leave them free to work and discover. The learning materials include practical life, sensorial, language and math skills. The afternoon session emphasizes math, language and writing skills. Children receive formal instruction in music, art, library science, technology and an introduction to Spanish and Mandarin. After school care for morning session is from 12:00 p.m.- 6:00 p.m. After school care for full day session is from 3:00 p.m. – 6:00 p.m. Attendance in the Extended Day Program is flexible. Parents may request the service as needed on a daily or weekly basis. There is such a wonderful family atmosphere at St. Aloysius Academy. We really do feel so at home and so blessed to have Liam with you.